Tech investors love SaaS companies, and 2013 was a phenomenal year for the valuations of public companies in the sector. As the year closed with multiples at an all-time high there was increased chatter about a tech bubble, especially in SaaS/Cloud-land. The first half of this year saw a correction in SaaS values but digging into the data shows that SaaS companies have still outperformed the market as a whole. 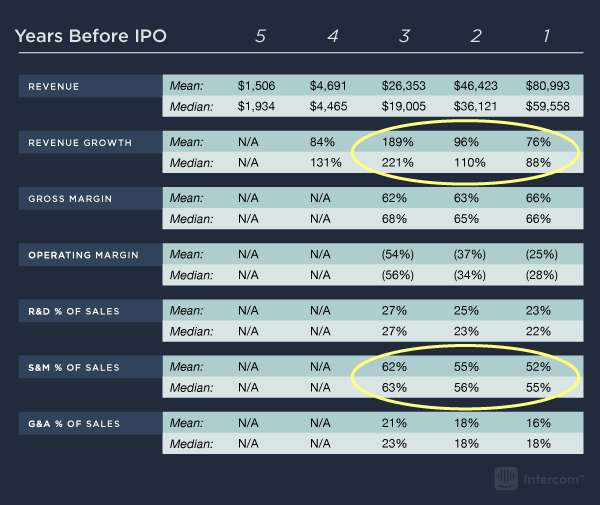 Since Intercom is a SaaS company I thought it would be interesting to take a more in-depth look at the market as well as the broader software sector today, and point out some common characteristics of successful SaaS businesses as defined by the public markets. Technology investors in the public markets are attracted to SaaS companies in large part due to their steady stream of recurring revenue, but also because they have strong growth prospects relative to traditional software companies. In the last decade there has been a surge of SaaS IPOs, as the business model has become the norm for both developers and end users. The hyper-growth nature of these companies has drawn a lot of attention to the sector, and while multiples and valuations have contracted in recent months, they are still extremely strong when looked at from a longer term historical perspective. Software Equity Group took 49 public SaaS companies and plotted their Enterprise Value/Revenue multiples back as far as 2004. The list includes notable players in the sector such as Workday, Salesforce, Netsuite, Veeva, and Marketo. Although the sector has gone through a correction in the first half of this year, amidst fears of another tech bubble, SaaS valuations are still up almost 250% since their bottom in 2008, and overall the sector is trading slightly higher than pre-credit crisis multiples. Most of these public SaaS companies continue to grow their annual revenues in the mid- to high-double digits and are still expanding their share in their respective markets. Allen Cinzori makes an interesting point in the report: looking at the distribution of multiples today for these SaaS companies, almost half of them have a multiple greater than 9.0x. This shows us that even within the SaaS space, valuations are biased towards the higher end of the range. And of course, if we look at the SaaS + broader software space, investors are willing to pay a general premium for SaaS companies specifically, because many of them are leaders in their respective verticals and are well positioned to take market share from, or even displace, the incumbent on-premise software providers. This valuation premium that SaaS gets can be seen more precisely, when we compare cloud software companies to the more traditional on-premise software providers. 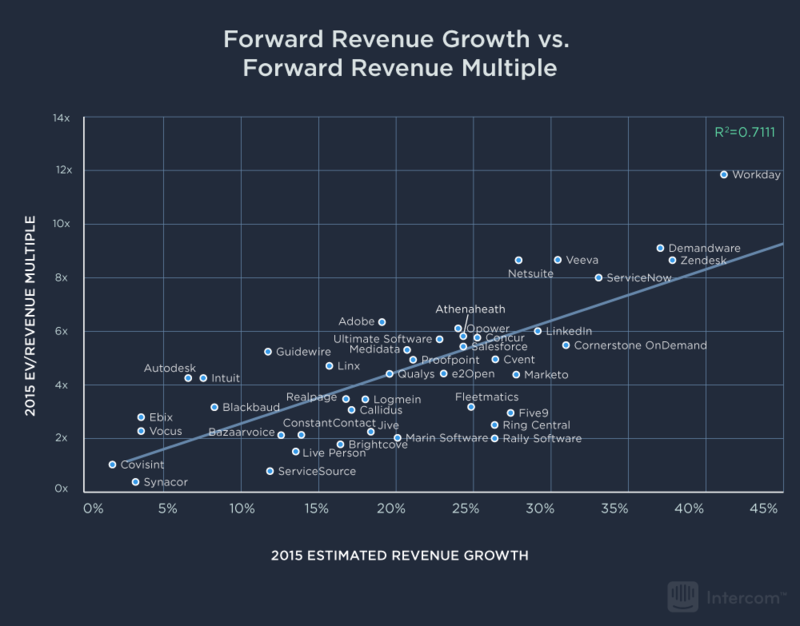 Public SaaS companies get higher valuations at all levels of revenue growth rates. 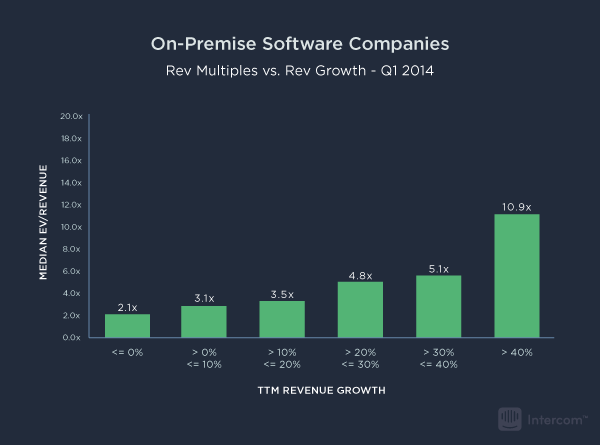 For example, looking at the charts below, the median revenue multiple for on-premise software companies that grew their annual revenue 30-40% is 5.1x, while the same multiple for a SaaS companies that grew revenue at that same 30-40% rate is 9.2x. 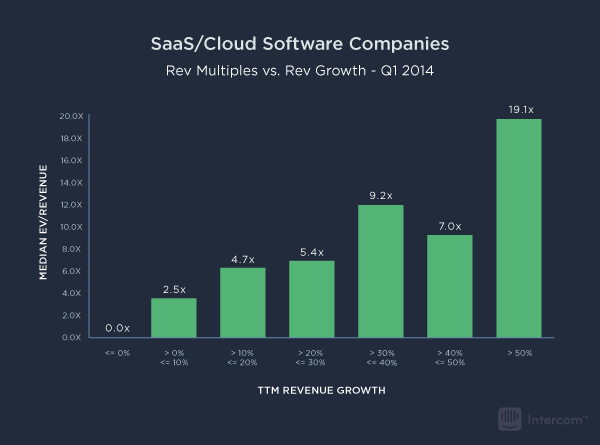 The interesting thing about SaaS is that investors care more about growth than anything else. 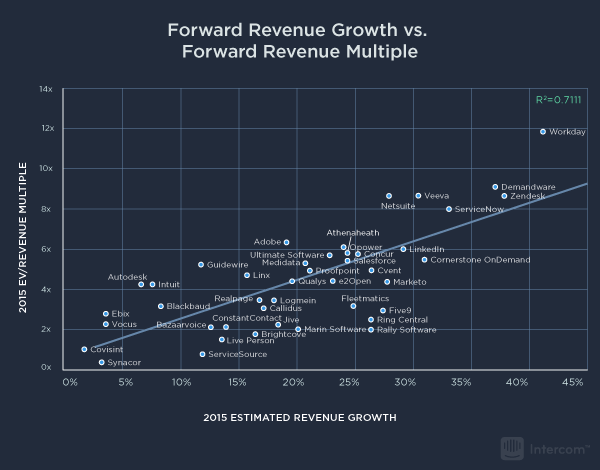 Running a correlation of forward revenue multiples vs. forward growth rates on public cloud companies, we see that valuation is very highly correlated to revenue growth. Fast growing companies are rewarded with rich valuation multiples. Investors are not too concerned about profitability though. 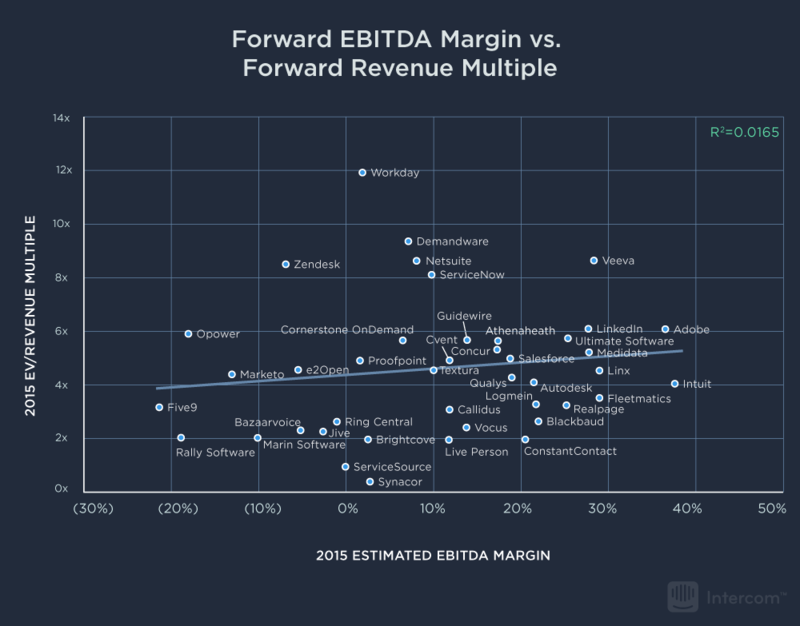 That’s right, SaaS valuations are not correlated to margins, as we can see in the correlation below. 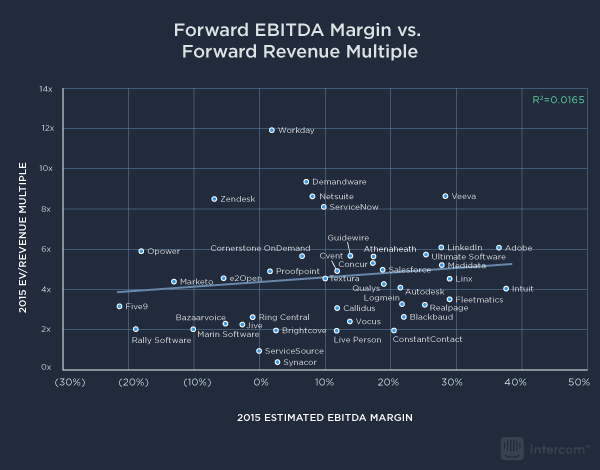 In fact, there are some instances where the public market tends to penalize SaaS companies with higher margins, using the logic that these companies have boosted their margins at the expense of revenue growth. It is interesting to note the higher revenue growth and higher operating margins for 2014 IPOs compared to 2013. That might imply that investors are now requiring better performance and have a higher standard of ‘success’ today, as the market environment is arguably tougher today than it was last year. How long does it take to IPO? A company can be highly successful well before it is IPO-ready, but how long does it usually take to finally get to an IPO? In short, it takes almost 10 years from founding for a SaaS company to IPO. The shortest was four years (DealerTrak), the longest took 14 years (RingCentral). Companies in the tech space overall also take a similar amount of time to IPO. 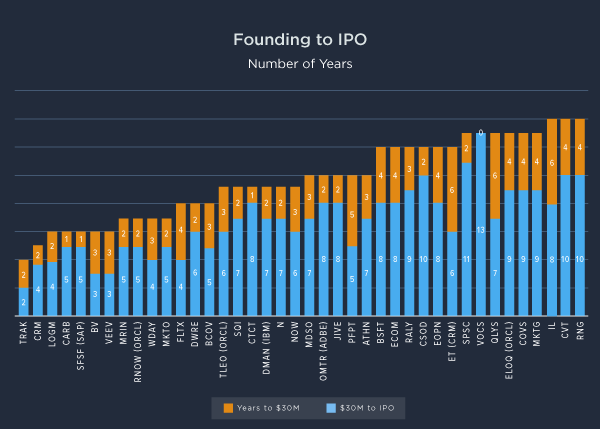 Out of all the companies that have or are planning to IPO this year, more than half were founded prior to 2007, and a good number were founded even more than 10 years ago, according to data from CB Insights. SaaS companies are arguably the stars of the tech sector especially in recent years, characterized by premium valuations, rapid growth in revenues and customers, and expanding market share. Correction or not, faster growing companies are rewarded accordingly with richer valuations. But the data also shows that it takes many years to build a solid and sustainable business that finally meets the standards of becoming a public company.